Before the cup campaign of 1939 the clubs committee decided they needed a big name to fill the vacant centre-forward position. They got in touch with some contacts in England, one of whom was the manager of Everton who suggested that Dixie Dean, who was at Notts County at the time, could be available. Although coming to the end of his career Dean was still one of the biggest names in football due to his goal-scoring feats during his time at Everton where he is still the club’s all-time leading scorer and also holds the record for having scored the most amount of league goals in a single season-60 in 1927-28. Despite rejecting Rovers initial offer the clubs improved second offer was accepted by Dean and a massive coup was pulled off by the club. A huge crowd turned up at Sligo Railway Station to give Dean a hero’s welcome. 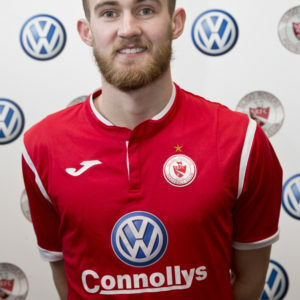 Dean duly scored on his debut, a game against Shelbourne in the Showgrounds on January 29 and went on to score nine more in his seven league appearances for the club, including five in a single game against Waterford. He also scored in the cup final of that year in the 1-1 draw with Shelbourne though the replay would be lost 1-0. He scored 11 goals in his 11 appearances during his spell with Rovers. Dean’s runners-up medal was stolen after the game but he did however have it returned to him seven years later while back in England. Dean returned to Ireland in 1978 to see Sligo Rovers play in the FAI Cup final of that year. Johnny Armstrong’s club record of 140 goals puts him far ahead of any other player in the clubs history with no other scoring more than 100 goals. His loyalty is also incredible having serves the club for 12 years leaving him third on the all-time appearances list. The Blackpool-born scot came to Rovers in 1951 after a promising start to his career with Chesterfield was curtailed by injury. He would notch 19 goals in his first season with the club despite generally being deployed on the wing which was followed up with 15 the next year. He would score 10 times in the first 10 games of the 1953/54 season including a club record run of scoring in eight consecutive games as he finished that year with 19 goals in a struggling side. He followed that up with his best ever scoring season amassing a total of 22 goals. His numbers dropped later in his career but he remained a key figure at the club before retiring at 38. Although he never won any medals with the club or even made it to any finals the individual records he holds guarantee him a place as one of Rovers all-time greats. David Pugh goes down as one of Rovers all-time greats with the commanding centre-backs career spanning 14 years from 1963 to 1977. Like Johnny Armstrong he was unfortunate to never be part of a team to win any silverware with the cup final of 1970 the closest he would come. 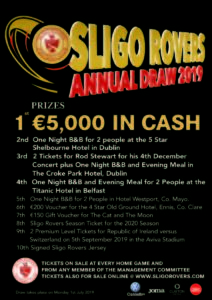 Growing up in Sligo he joined Rovers on their return to football after a one year absence in 1963 and quickly established himself as a mainstay of the team. In 1967 he left for America where he would join Boston Beacons and have the honour of playing against the legendary Pele. On his return to Ireland he initially played one season with Shamrock Rovers where he won an FAI Cup before returning to Sligo the following year. That would be the year that Rovers reached the cup final with two replays required to separate Rovers and Bohs with Pugh going very close to winning it for Rovers on one occasion. He would remain with Rovers for the next seven years even serving as caretaker manager for a short stint before Billy Sinclair took over. He made one appearance during the league winning season of 1977 but back injuries forced him to retire. He managed Rovers for a season in 1989 and returned as assistant to Jim McInally in 1999. He made a total of 308 appearances during his Rovers career. Johnny Brooks holds the distinction of being the only Rovers player to finish a season as the league’s top scorer. He did so by netting 15 goals in the 1966/67 season to finish tied with Danny Hale of Dundalk after joining from York City. This was achieved in his first season with the club as a 22 year-old after a number of injuries curtailed the former England underage international’s progress. Injury would also restrict him to just 12 league appearances the following season though he still managed seven goals including a hat-trick in less the three-and-a-half minutes in a 7-1 win against St.Pats. He would leave the club after the season being sold to Boston Beacons in the USA for £4,500 but returned for the 1969/70 season to help Rovers on their run to the Cup final. Although not as prolific as during his first spell he did score in the semi-final against Cork Hibs with a spectacular lob.In total he scored 30 during his time with the club. No man has played more times more Sligo Rovers and arguably no man has made a bigger contribution to Rovers successes than Tony Fagan. 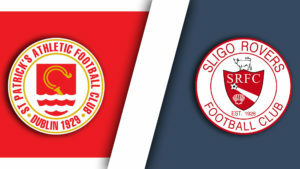 Growing up close to the Showgrounds it was always the dream of ‘Fago’ to play for his local team and he fulfilled this ambition by making his debut against Shamrock Rovers in a Shield game in the Showgrounds on September 10th 1967. His Rovers career would finish against the same opposition 20 years later. Things weren’t going well for Rovers as he started his career with the club having to apply for re-election and also suffering the embarrassment of being knocked out of the FAI Cup to non-league Longford Town. Things would pick up in 1970 with Fagan helping Rovers to the first of four cup finals he would play in with the club. He would remain a constant in the Rovers team throughout the 70s finally getting his hands on silverware as a part of the league winning team in 1977. He would taste more FAI Cup disappointment in the finals of 78 and 81 before finally getting his hands on the trophy in 1983. He would again be a key member of the success scoring the winner in the quarter-final with a free-kick against Shamrock Rovers. He would finish his career with a short spell with Finn Harps before returning to manage the club’s reserve side for a few years. His record of 590 appearances in a Sligo Rovers shirt is unlikely to ever be surpassed. Centre-back tony Stenson joined the club from Sheffield Wednesday in 1969 and went on to play a major role in some of Rovers greatest occasions over his 15 year career with the club. In his first season Rovers reached the FAI Cup final against Bohs. It was to go to three replays with Bohs only scoring shortly after Stenson went off injured. He initially formed a partnership with David Pugh before the arrival of Chris Rutherford and together they would be central to Rovers league title win in 1977. He would have to endure two more cup final disappointments before finally getting his hands on the trophy in 1983. He would produce the goal to put Rovers back on level terms in the second half with an excellent volley despite picking up an injury earlier in the game in a show of spirit typical of ‘Stenny’. Injury would bring his career to a half just a year later but he still managed a total of 387 appearances for the club a total only surpassed by Tony Fagan. Paul ‘Ski’ McGee would have several spells with Sligo Rovers producing many memorable moments but without doubt his crowning glory came on the day that Rovers won the league title in 1977 with his goal sealing the 3-1 victory. It was a fitting end to an incredible season for the local who finished as top scorer and earned himself a move to the old English First Division with QPR where he would enjoy a successful time and earn 15 international caps scoring 4 goals. A very talented youngster he made his debut for Rovers at 16 before going to England for a spell in the lower divisions with Kidderminster and Hereford. He returned to Rovers after a spell with Finn Harps in time to inspire the league success with his corner leading to Rovers taking the lead on the final day against Shams. He would return to the club for several spells in the late 80s and early 90s continuing to score regularly to leave him with a total of 50 league goals from his time with Rovers. His career total of 143 league goals puts him in 11th in the league’s all-time standings. Striker Mick Leonard came to the club from Celtic in 1975. He would make an immediate impact by scoring a hat-trick early in his career in the League Cup semi-final against Drogheda and also helping Rovers to a 3-2 win over Shamrock Rovers with two goals on his league debut. He would continue that prolific for and end up with 21 goals in his first season. The next year he would be joined up front by Gary Hulmes and their strike partnership fired Rovers to a league title with the pair combining for 24 goals. He also went on a run of nine goals in as many games during the season. He would continue his fine goalscoring the next season scoring 11 goals in 21 games until transferring back to Scotland in January wher he would finish top scorer with Dunfermline for three seasons. His final record was an impressive 45 goals from 93 games. Chris Rutherford the Liverpudlian joined Rovers from Cardiff in 1975 as a 20 year old can hardly have imagined the long career he would go on to have in Sligo. The centre-back quickly established himself as a key figure in Billy Sinclair’s team forming a formidable partnership at the back with Tony Stenson. In only his second season with the club he would play a major part in the club’s league title win scoring the goal to put Rovers in front against Shamrock Rovers on the day the league title was won. He would also play a key role in Rovers wining the 1983 FAI Cup by scoring two goals in the semi-final that eventually seen off Cobh Ramblers but would suffer an injury early in the final and misses the rest of the game. Unfortunately a broken leg suffered against Galway in 1984 would end his career prematurely at the age of 28. However his involvement with the club didn’t end there as after a spell as Finn Harps manager he would serve as assistant to Dermot Keely, Wilie McStay, Lawrie Sanchez, Steve Cotterill, Jimmy Mullen and Nicky Reid. He would also fill in as caretaker manager on several occasions including for Rovers first ever European win in Malta against Floriana in 1994. He finished with 281 appearances in his career with Rovers. 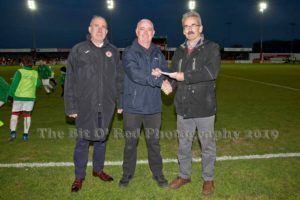 Paul Fielding played a major role in two of the most historic seasons in Sligo Rovers history. Firstly as a member of the 1977 league winning team and six years later by managing Rovers to a first ever FAI Cup win. After a good career with Rochdale came to an end Fielding was one of Billy Sinclair’s recruits who formed the core of the league winning side. Operating mainly in mid-field and later as a full-back he played in every game as Rovers won a second ever league title. The following year he was to suffer the mis-fortune of conceding the late penalty which won the 1978 FAI Cup final for Shamrock Rovers. He left to play one season with Glenavon but returned for a second spell in which he would become player-manager replacing the departing Patsy McGowan. In the job he would succeed where so many had failed as he masterminded Rovers first ever FAI Cup win. He would play a major role on the pitch on the day of the final having to come on in place of the injured Chris Rutherford and play for most of the game. He left the club in 1985 after making 263 appearances for the Bit o’ Red. Like Paul Fielding, Gary Hulmes joined Rovers from Rochdale and went on to play a major role in Rovers league winning season of 1977. He immediately formed a formidable partnership with Mick Lenoard with his pace complimenting the Scot’s strength. He would finish the season with 13 league goals making him the joint-top scorer with Paul McGee. 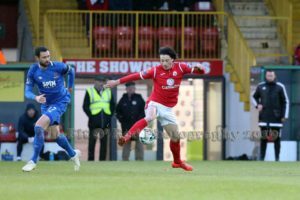 The most important of his goals came on the final day of the season as Rovers clinched the title as he scored with a header after just six minutes from Charlie Ferry’s cross. He would play in the 1981 FAI Cup final before moving on to Limerick where he did win the FAI Cup in 1982. His career in Ireland seen him score 106 goals with a total of 54 from his 129 games for Rovers. Harry McLoughlin will forever be remembered as the Sligo town man who finally ended Rovers FAI Cup hoodoo with a spectacular strike. He signed for the club just after the league win of 1977 and the winger made his debut against shamrock Rovers in Milltown. He would quickly experience the disappointment of losing a cup finals featuring in the losses to Shamrock Rovers in 1978 and Dundalk in 1981 which was after scoring the winning goal in the semi-final of that year against Waterford. But his most famous goal came in the final of 1983 with the match level at 1-1 he picked up the ball on the left wing before cutting inside and curling the ball beautifully into the top corner and winning the cup for Rovers at last. He would make a total 315 appearance for the club scoring almost 50 goals including being top scorer in the first season of the First Division with 11 goals. He would stay with the club until 1990 before finishing his career with spells at Finn Harps and Longford Town. Donegalman Brendan Bradley without doubt has to go down as one of the greatest players the league ever season as its all-time leading scorer with 235 goals. Although most of these came with his local team Finn Harps he did spend three successful seasons with Rovers after following manager Patsy McGowan from Ballybofey. He was already established as one of the league’s finest goalscorers when he joined in 1979 and even once scored six in a single game against Rovers. Although he would score just 11 in his first season he came into his own the following year notching 19 as Rovers reached the FAI Cup Final only to be denied by Dundalk. He would follow that up with a further 21 the next season but that would be his last for Rovers as he once again followed McGowan back to Finn Harps. His total of 51 goals puts him among Rovers top scorers despite only playing three seasons in the Showgrounds. Until recently Martin McDonnell held the distinction as being the only Rovers player to have won two FAI Cups. That record no longer remains. His father, an ex-Dundalk and Crusaders player moved the family to Sligo when Martin was just 11 and in 1980 at the age of 18 had made his debut for Rovers. His final game for Rovers would come 18 years later in 1997. He appeared as a substitute in the FAI Cup final of 1981 but would the left-footed mid-fielder would have a much greater influence on the final two years later which Rovers of course were to win. It was his free-kick that led to Rovers equalising through Tony Stenson while he also played the pass to Harry McLoughlin before he scored his legendary winner. 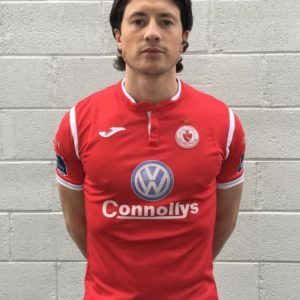 After one more season he left for Galway United where he won a League Cup and an FAI Cup runners-up medal but returned to the Showgrounds after Dermot Keely had won promotion. Now mainly playing at left-back he would play a key role in Rovers treble win in 1994 before eventually finishing his career with Athlone. He would be back in the Showgrounds a few years later however as assistant manager to Tommy Cassidy. He made a total of 284 appearances for Rovers scoring 15 goals. Gavin Dykes was a local who served the club for nearly ten years after making his debut in 1987 against Cork City. A commanding centre-back who captained the club on many occasions he was part of the team that won promotion to the Premier Division in 1990 under Dermot Keely but would suffer the disappointment of relegation a few years later in 1993. However that would be followed by the most successful year of his career as he captained the side to a historic debut. Under manager Willie McStay he formed an effective partnership with Declan Boyle at the back first winning the First Division Shield with promotion back to the Premier Divsion as champions being secured later in the season. The most famous day would be the 15th of May in the FAI Cup final with Dykes as captain Rovers were victorious over Derry City allowing Dykes to lift the Cup. He stayed for another two seasons playing a role in Rovers European win in the Cup Winners’ Cup before leaving to join Derry City. He would go on to have spells as manager there and also at Finn Harps and Kildare County. He played 323 games for Sligo Rovers. Johnny Kenny, the tricky winger from Riverstown, holds a couple of distinction in the history of Sligo Rovers. He holds, along with Padraig Moran the record for the most appearances in European competition with eight while he is the club’s top scorer in European competition with two goals. After beginning his career with Galway United he was signed by Willie McStay for the start of this historic treble-winning 1993-94 season. He would start every game in that season and finish as the club’s second highest scorer behind Eddie Annand with 12 goals including one on his debut against Galway and a famous wonder strike in the first floodlit game in the Showgrounds on November 26th 1993. He also scored in the final of the shield to help Rovers pick up the first piece of silverware that year. He would be rewarded for his fine form with a call-up to train with Jack Charlton’s Ireland team. He would play a major role in the club’s Cup Winners’ Cup campaign the next year scoring in the home leg against FC Brugges to keep the tie alive going into the second leg. He would spend another two seasons after this with the club and scored his second European goal in the 1996 Intertoto Cup scoring the second of three goals as Rovers came back from 3-0 down to draw with French side Nantes. He departed the cub for Finn Harps having made 171 appearances and scored 26 times for Rovers. Although Scottish striker Eddie Annand only spent two full seasons with Rovers he left his mark as a prolific goalscorer during his time. Originally brought over on loan from Partick Thistle by countryman Willie McStay he would sign permanently for the club for the 1993/94 season. He would finish the season as Rovers top scorer with 17 goals including several key strikes to help Rovers to the treble with his pace always causing problems for opposition defences. His goals including one in the opening round to help Rovers past Glenmore Celtic and also the only goal of the game against Limerick to put Rovers into the final. There he would set up the winning goal with his corner being headed home by Gerry Carr. He would also score the goal that sealed the First Division title for Rovers in a 1-0 win over Bray Wanderers. He would prove himself well-able for the step up in level by again finishing as Rovers top scorer with 17 goals, 12 of which were in the league as Rovers finished comfortable in mid-table. He would also help Rovers to a major cup win with his two goals knocking Bohs out of the quarter-finals in a 2-0 win before falling at the next hurdle against Shebourne. He left to return to Scotland at the end of that season where he continued his goalscoring exploits. His time with rovers produced a magnificent 34 goals in 80 games. Padraig Moran is Rovers second-highest goalscorer behind Johnny Armstrong and the best in the modern era while he also helped Rovers to four trophies during his time. The Athlone-born man came to the club during the 1993—94 season originally as a winger but became converted into a striker. He would finish his first season at the club as top scorer despite only scoring in two games (he scored four against Cobh and one against St. Pats) with five goals in a relegated Rovers side. The next year would be far more successful with the club winning three trophies helped by Moran’s six goals. He would only score two times the next year but one of those gave him the honour of being the first Rovers goalscorer in Europe when he scored the first in a 2-2 draw against Floriana in Malta. In all he made eight appearances with rovers in Europe a record he shares with Johnny Kenny. The following year would see him excel as a goalscorer as he scored a career-best 17 times. This included two goals to help Rovers to the League Cup final where his goal in the second leg against Shelbourne put Rovers 2-0, however Shelbourne would come back to deny Rovers on penalties. He would only have to wait two years to gain revenge as he scored another three goals in the run which this time seen Rovers defeat Shelbourne in the final. One of the three was the only goal to settle the two-legged semi-final against Home Farm. Injury would strike him down forcing him to miss a lot of playing time with his 11 goals upon returning to the team in 1999/00 not enough to prevent relegation. He scored 16 in the First Division but Rovers missed out on promotion and he left to join Derry. He scored a remarkable 62 league goals and 82 in total during a decade with the club. 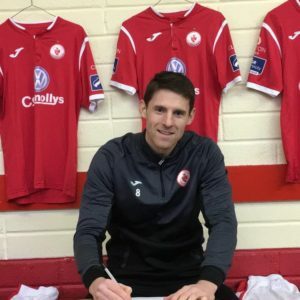 Conor O’Grady grew up in Sligo town a massive Rovers fan and would go on to be one of the most decorated players in the club’s history over two spells with the club. 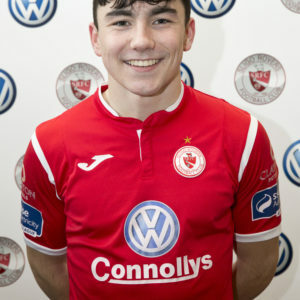 He made his debut as a 17 year old on January 2nd as a substitute against St. Pats and would quickly establish himself in the first-team winning a League Cup winners medal coming on as a substitute in both legs of the final against Shelbourne. He was made captain of the side under Jim McInally and also won underage caps with the Republic of Ireland. He would leave the club shortly after relegation to the First Division in 2000 and signed for cork City. There he would be named Player of the Year for the 2001/02 season but injuries soon curtailed his progress and he left a year later to sign for Derry City. Again injuries restricted his appearances and he eventually returned to the Showgrounds under Sean Connor for the 2005 season. The central mid-fielder would play a key role as Rovers topped the First Division to return to the top flight. He would remain a central figure in the side and was captain on many occasions as Rovers established themselves in the Premier Division but he would suffer the disappointment of missing the 2009 FAI Cup final through suspension. His final year would be the most successful as he was a part of the squad that one both the League cup and the FAI Cup. He would come on as a sub in the final of the latter and although he missed a penalty in the shoot-out would still earn himself a winners medal. After making a total of 281 appearances and scoring 16 goals he left at the end of that season joining Finn Harps. Kilybegs-born Seamus Coleman first came to Rovers attention when playing in a friendly for his local side St. Catherines against Sligo Rovers and was signed shortly after in 2006. He made his Rovers debut as a sub against Derry City in the Brandywell on October 17th 2006 with his first start coming on November 3rdaway to UCD. He quickly established himself as the club’s regular right-back the following season as Paul Cook took over as manager and earned his first Ireland under-21 cap against Sweden in October. He scored his only goal for Rovers the following season in a home win against Bray but his attacking dribbles and crosses up the right would create several more goals. He helped Rovers to qualify for Rovers for the first time in 12 years at the end that season with his outstanding performances attracting the regular attention of several scouts from all over the UK. Eventually Premiership Giants Everton signed the Donegal man where he has gone on to establish himself as an important player and was nominated for the PFAI Young Player of the Year for his performances in the 2010/11 season. He has also established himself as a regular in the Ireland national team.